Global Industrial Slatted Steel Trash Cans Are Perfect For Parks, Universities, Apartment And Office Complexes And City Streets. Slatted Steel Fully welded durable receptacles feature a rugged, long lasting flat bar steel body with a polyester powder coated finish that deters graffiti and vandalism. Metal top band for extra strength. Provides premium corrosion protection making them great for outdoor use. Available with Flat Lid, Multi-Stream, Rain Cap Lid or Dome Lid to prevent rain or snow from entering container. Slatted waste containers include anchor kit and black plastic liner. Choose from 24 Gallon or 36 Gallon sizes. Slatted Trash Containers with Access Door help reduce heavy lifting and ease servicing, even in tight areas. Access door is padlockable to prevent unsolicited opening. Door features heavy duty hinges for smooth and easy opening. 2 stage finishing protection process resists rust and increases durability. Available in 36 gallon capacity. Blue recycling version is available in 36 Gallon capacity with flat, rain cap or dome lid and recycle logos. Click here to see our Recycling Version Waste Receptacles. Expanded Metal Waste Receptacles Are Attractive, Durable And ADA Compliant. 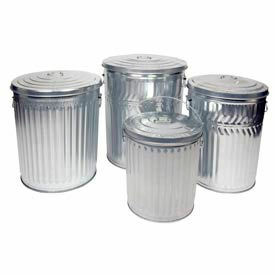 These metal trash cans feature a rugged expanded steel body reinforced with circular bands, vertical ribs and curled edging for extra strength and support. 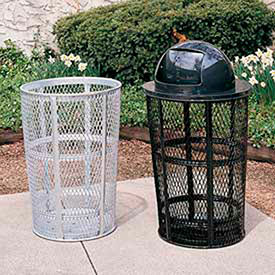 Expanded metal garbage cans endure extreme climate conditions to make them great for outdoor use. 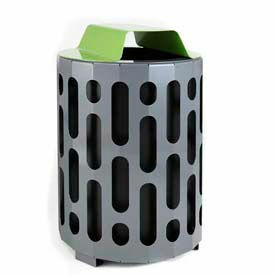 These steel trash cans are perfect for parks, universities, apartment and office complexes and city streets. 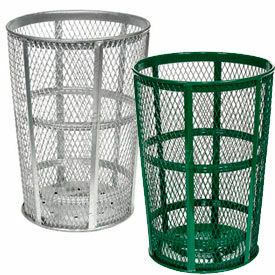 Mesh trash cans are ADA compliant. Choice of Galvanized or Powder Coat Finish in Black, Blue, Green, or Red. Optional Lids available (sold separately). Lids are sold individually. Global Industrial Thermoplastic Coated Receptacles Are Ideal for Schools, Public Parks, Outdoor Office Areas and More. Trash receptacles feature a protective coating that creates a smooth, high-gloss surface that stays cool to the touch. Rugged 1/8" thick, 11 gauge steel frame is thermoplastic coated to resist fading, mold and vandalism, and will ensure maintenance-free durability. Lid and base are shielded with a black powder coat finish for rust-prevention and resilience against the elements. Available in Mesh 3/4" diamond openings and Perforated 5/8 " diameter punched hole pattern. Lid styles are Flat, Multi-Stream, Rain Bonnet or Dome Lid to prevent rain or snow from entering container. Standard models include lid option, plastic liner and security cable. Deluxe models include lid option, plastic liner, security cable and base to help increase ease of service. Assembly required. Recycling versions are available in blue flat, rain bonnet or dome lid styles that include recycle logos. 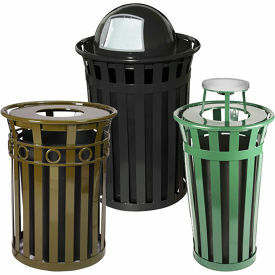 Click here to see our Recycling Version Trash Receptacles. Galvanized Steel Garbage Cans Withstand The Toughest Environments To Last A Lifetime. Made using prime, heavy gauge galvanized steel with zinc treatment for corrosion resistance. Deep body corrugations for superior strength. Commercial Duty Cans is perfect for light-duty commercial use and made using 27 gauge galvanized steel. Medium Duty Cans are made using 25 gauge galvanized steel. Heavy Duty Cans meet most government specifications and are made using 23 gauge galvanized steel. Optional Lids protect contents while sealing in odors. Lids help garbage cans comply with OSHA standards (sold separately). Global Industrial™ Outdoor Slatted Access Door Trash Cans Are Perfect For Parks, Universities, Apartment And Office Complexes And City Streets. Fully welded durable receptacles have a rugged galvanized steel body that is reinforced with circular bands and rolled edges. Flat bar steel deters graffiti and vandalism. Electro-coating plus powder coating two stage protection process resists rust and increases durability. Ergonomic access door with slide out liner helps reduce heavy lifting and ease servicing. Doors feature heavy duty hinges and rubber bumpers for smooth and quiet opening. Receptacle door is padlockable to prevent unsolicited opening. Available with Flat Lid, Rain Cap Lid or Dome Lid to prevent rain or snow from entering container. Slatted waste containers include anchor kit, leveling feet and black plastic liner. 36 Gallon Capacity. Blue recycling version is available with flat, rain cap or dome lid options with recycle logos. 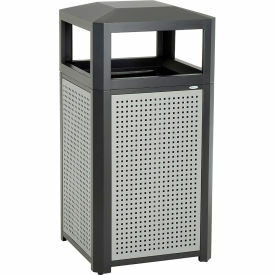 Perforated Steel Waste Containers Provide A Clean, Modern Appeal To Any Outdoor Environment. Mounting Brackets and Lid Kits are available for Pole/Wall mount receptacles. 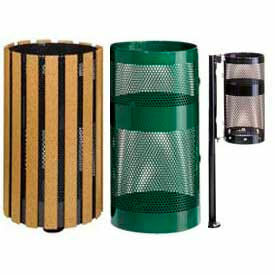 Wydman & Oakley Series Waste Receptacles & Cigarette Urns Offer A Decorative & Functional Design That Is Great For Use Outdoors. Used for parks, city sidewalks, municipalities, university campuses and apartment & office complexes. Heavy duty steel with flat bar slats helps deter graffiti and vandalism. Includes anchor kit for added security. Adjustable leveling feet for uneven surfaces. Powder coat finish. Urn Basket features a galvannealed steel liner. Helps snuff out and dispose of cigarettes. Waste Receptacles with Lid include a lid security chain to prevent theft of lid and a durable plastic liner for easy maintenance. 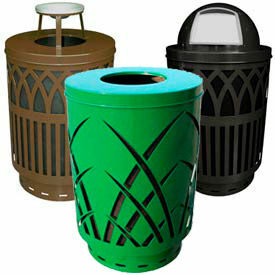 Receptacles are available with 4 Top Lid Options: Ash, Dome, Flat or Rain Tops. Covington Series Steel Outdoor Waste Receptacles Are Used For Parks, Schools, Shopping Malls, Campus Sites And More. 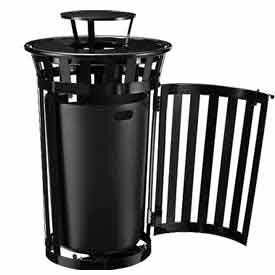 Covington Steel Outdoor Waste Receptacles are made of 10 gauge galvannealed steel with a powder coat finish for long lasting durability. Includes lift-off lid and 40 gallon black high density polyurethane rigid plastic liner for easy maintenance. Lid includes an encapsulated cable to secure lid to unit. Stainless Steel leveling feet allow freestanding use on uneven surfaces. Anchoring feet with hardware allow permanent installation to prevent theft. Plastic Base helps eliminate rust, protects concrete and offers a longer lasting base solution. Limited Warranty. Choose between two styles Classic or Sawgrass. Available in Green, Brown, Silver and Black. Lid options include Ash Top, Swing Top, Flat Top, Dome Top or Rain Cap..
Thermoplastic Coated Trash Receptacles Are Vandal Resistant And Virtually Maintenance Free. Thermoplastic coating is UV protected, prevents mold and mildew, and resists cutting and vandalism. Heavy duty, all welded steel offers superior strength for impact resistance and UV stability. 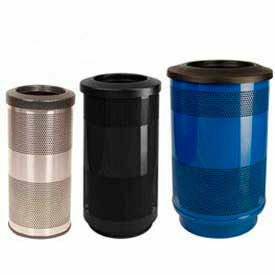 Diamond Receptacles feature expanded metal mesh with 3/4" openings. 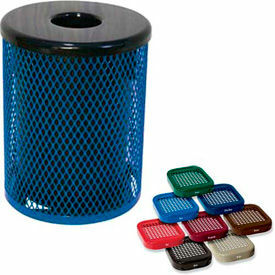 Perforated Receptacles feature perforated metal with 5/8 diameter punched pattern. Fiesta, Slatted, and Wave patterns also available. Global™ Receptacles include lid option, plastic liner and security cable. Deluxe models include a base to help increase ease of service. Assembly required. UltraPlay Receptacles offer optional plastic liner to allow easy waste disposal and low maintenance; optional lids available (sold separately). Metal Waste Receptacles Are Used For Office Complexes, State And Federal Buildings, Restaurants, Parks, And More. 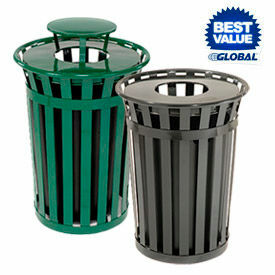 Waste receptacles are made of all-welded, high quality steel with powder coated paint for long lasting durability. Designed to collect waste in high traffic areas. All receptacles are stain, starch resistant and are weatherproof and UV stabilized for outdoor use. They can withstand extreme temperatures and weather situations. Choose between Open/Flat Top lids that provide easy access for waste disposal or Dome/Rain Cover Tops with Cigarette Snuffer that protect receptacles from environmental elements. Trash containers also include a rigid plastic liner to improve dependability, hold trash bags in place and control mold growth. Available in a variety of colors. 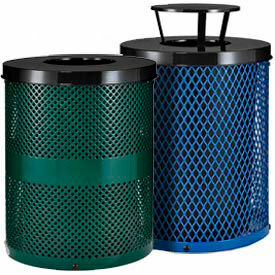 Perforated Steel Trash Receptacles Offer Durable Indoor And Outdoor Garbage And Recycling Maintenance. Stadium Series® Perforated Steel Trash Receptacles are made with heavy gauge perforated steel with a solid middle ring that provides an attractive appearance to any application. Large opening allows easy access for disposal. Containers are available in stainless steel or with a powder coat finish for long lasting durability. Trash cans include plastic liners that are reusable for easy waste disposal. Available with Dome, Flat, and Hood Lid Tops. Storage capacities are 10, 20, and 55 gallons. Colors are Black, Blue, Green, Red, and Stainless. Non-Returnable; Non-Cancelable. Dimensions vary per model. Parks, Bus Stops, School Yards Are Just a Few of The Places You Might See These Durable RELIUS SOLUTIONS Expanded Metal & Ex-Cell Containers. Super-strong units include expanded metal sides that are welded for increased rigidity. Base has drain holes to prevent fluid build up. Choose either RELIUS SOLUTIONS expanded metal containers or Ex-Cell Landscape Series receptacle. Available lid options for both trash receptacles. Stingray waste receptacles boast unique design and easy access side opening to liner. Features also include hidden latch closing preventing unwanted access, and easy installation into any outdoor location with achorable feet. All metal construction and heavy guage HRS, and heavy duty rotationally moulded plastic liner. Finished with RAL super durable TGIC-Free polyester powder coating.